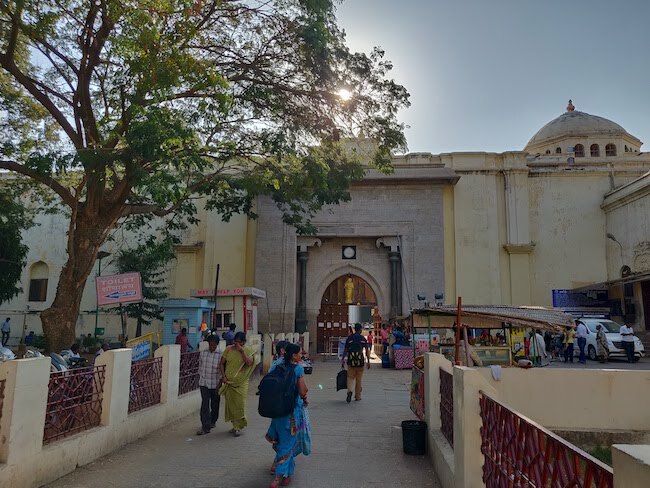 The Thirumalai Nayakkar Mahal, Madurai’s prized possession, sits facing a line of tea shops and a few other stores on Panthadi First Street. 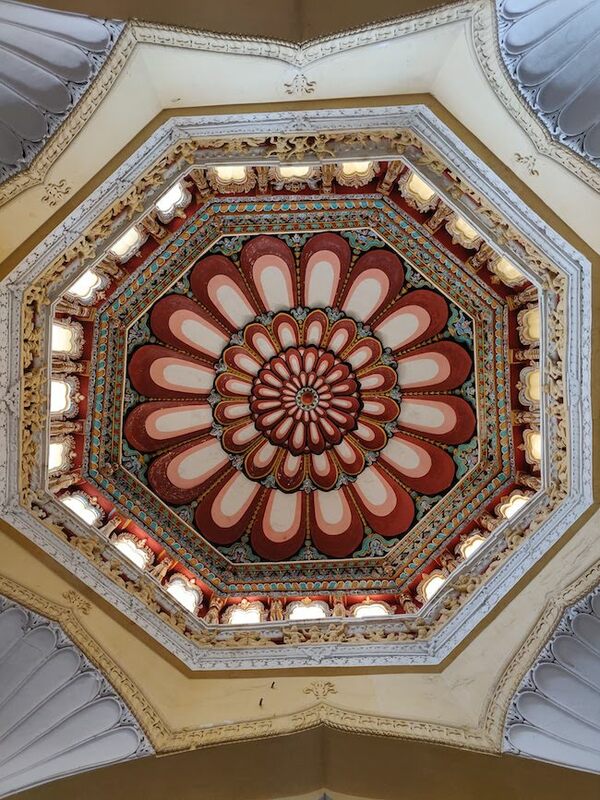 If you aren’t specifically headed to the Mahal, you might actually miss this 17th-century palace while driving through this permanently hot south Indian city. This road that leads to the Mahal was once part of the agazhi (trench) that ran around the palace, we’re later told. Remains that indicate the palace’s original size can be found even today. 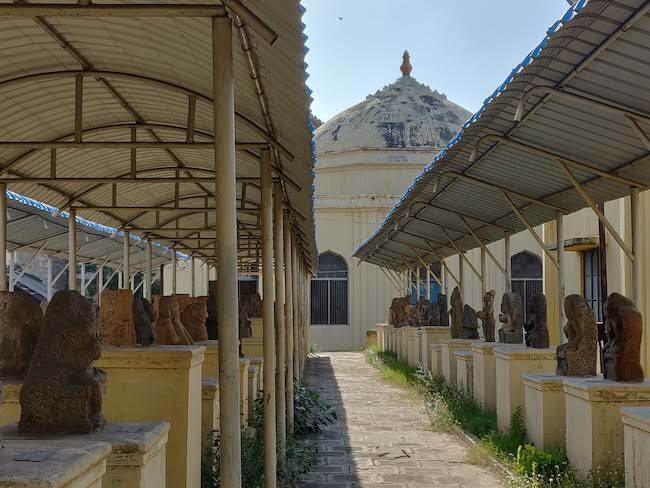 “The pathu thoon sandhu that lies 50 metres north from the palace walls is a testament to the fact that it was indeed bigger in its original form,” says TN Archaeological Department’s Assistant Director (AD) Sakthivel who was previously its curator. 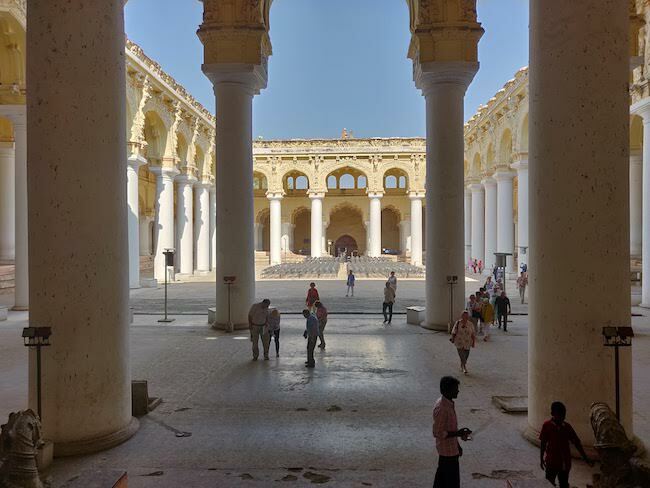 Although a modest entrance to its grandeur, Thirumalai Nayakkar Mahal’s reputation brings in thousands of visitors even today, both local and foreign. “In a month, we get about 3000 to 4000 visitors,” says the AD. Through the stone archway, the palace opens up to a huge sunlit courtyard, now occupied by rows of iron chairs. The Mahal is marked by elaborate geometric designs in colourful paints on its ceilings, with motifs of snakes, yali, strangely metamorphosed animals and celestial maidens springing forth from atop the pillars, while a lone throne with dark red upholstery dusty from years of unuse sits empty, facing the wide courtyard from the cool, dark raised platform. 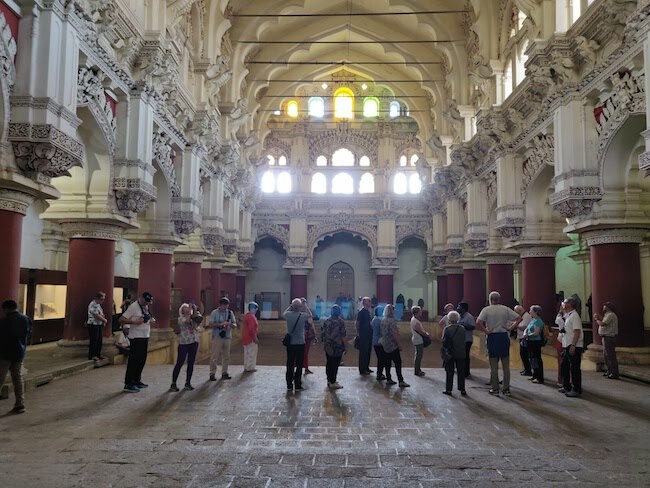 The palace offers relief from Madurai’s fiercely hot streets, but the sight we experience today is surely different from what the palace was, close to 400 years ago. 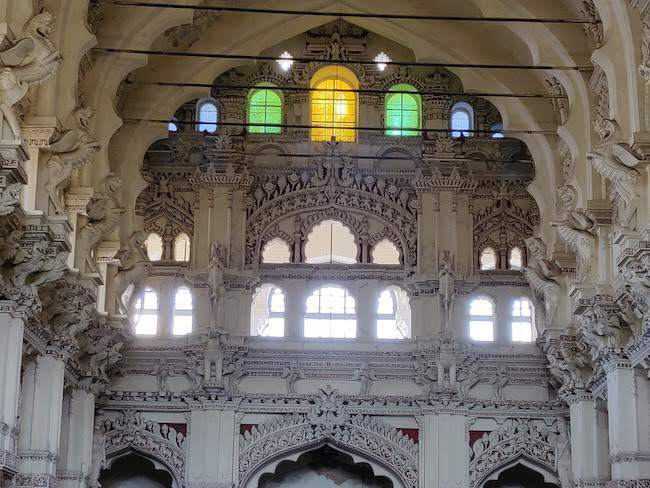 Inside, the Mahal houses a museum, a quaint room that was earlier the drama hall with stained glass windows high up on the walls. While archaeological references to the Mahal in the form of inscriptions do not exist, the earliest mention of it can be found in the book called Madurai Kovil Thiruppani aka Thiruppani Maalai says AD Sakthivel. 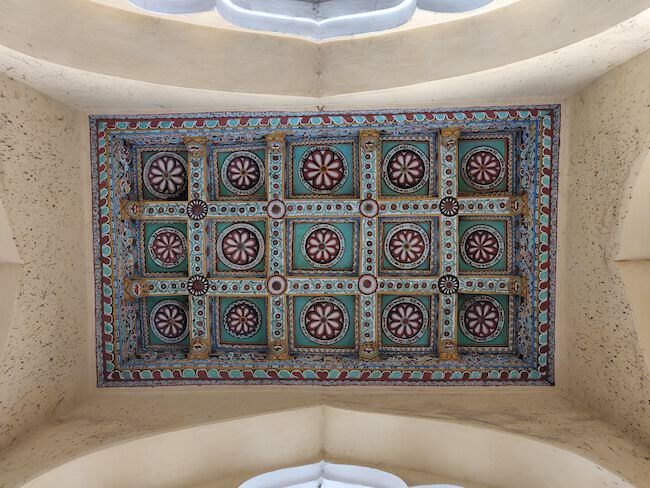 This Mahal, which was completed in 1636, has unverified accounts of having had an Italian architect. The text throws light on some of the materials that were used in its construction - shell lime (sunnambu) and jaggery smoothed over bricks with a paste of harde whole (Kadukkai), gooseberry and belleric (Thandrikkai), resulting in a structure that remains unshaken. Yet, when the Mahal was taken over by the Britishers in the 19th century, it was in a near dilapidated condition, having lost its sheen. The pari-madhil, outer walls, had collapsed during the 1860 Vaigai floods and were later torn down. It was Lord Napier, the then Governor of Madras, who in 1858 did everything he could to restore the building to what we see today. “He spent Rs 2 lakhs, over Rs 20 crores in today’s value, in renovating the palace. Mr Chisholm, the government architect, was assigned to look over renovations to the palace. 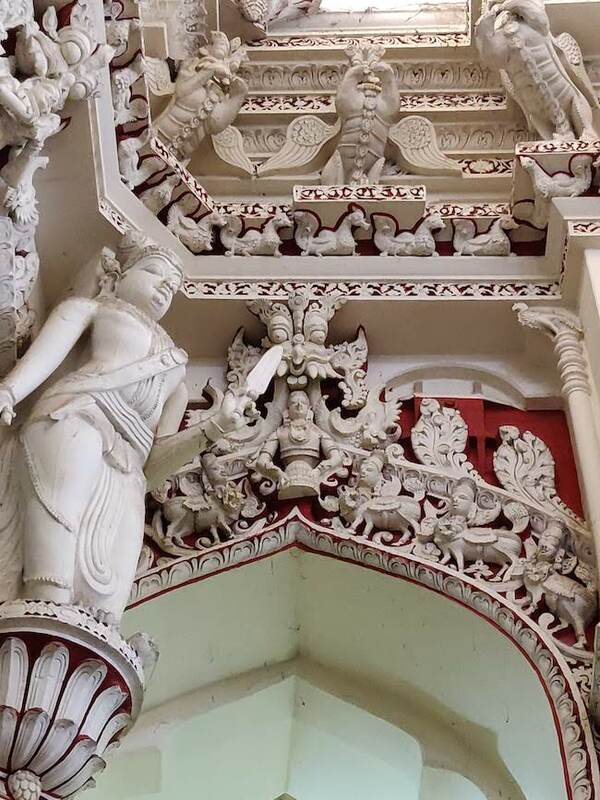 The Mahal’s white plaster was Napier’s doing. The pillars stood in granite before that. The entire Mahal’s size was four times bigger than what we see today,” says Sakthivel. The Mahal has a total of 248 12-ft wide pillars, some rising up to a height of 48 feet. It primarily consisted of two parts, the Swargavilasa and the Rangavilasa. 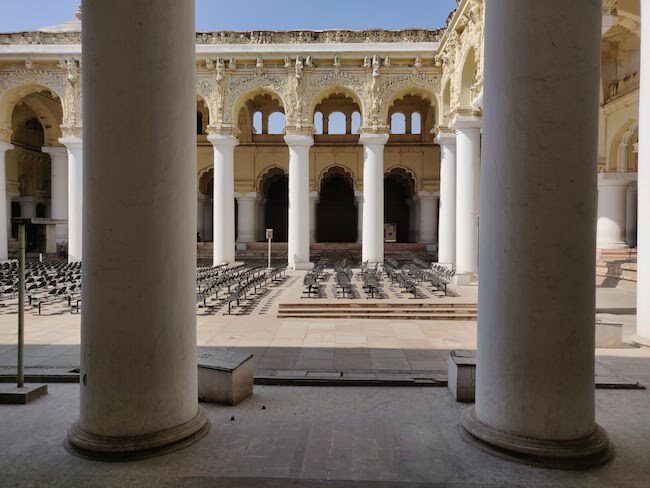 Besides these, it also had a theatre, a temple, queen's apartment, armoury, building for housing palanquins, royal bandstands, pond, gardens and more quarters for guests and palace servants. 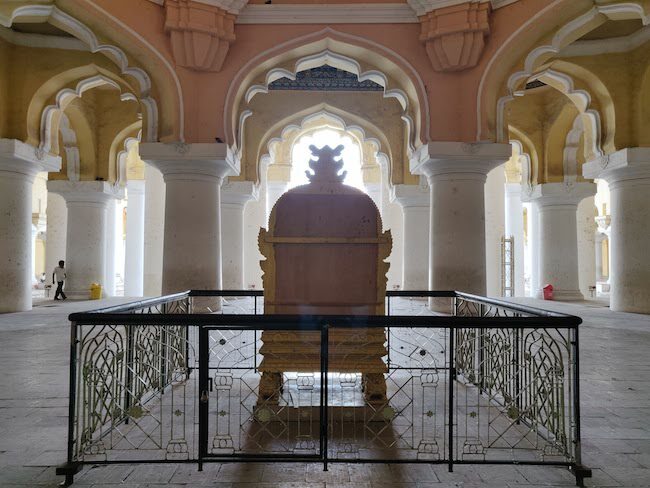 Parts of the palace, especially the Rangavilasa, were torn down by Thirumalai’s grandson Chokkanatha Nayak, with an intent of re-shifting the palace back to Trichy - their capital before Madurai. 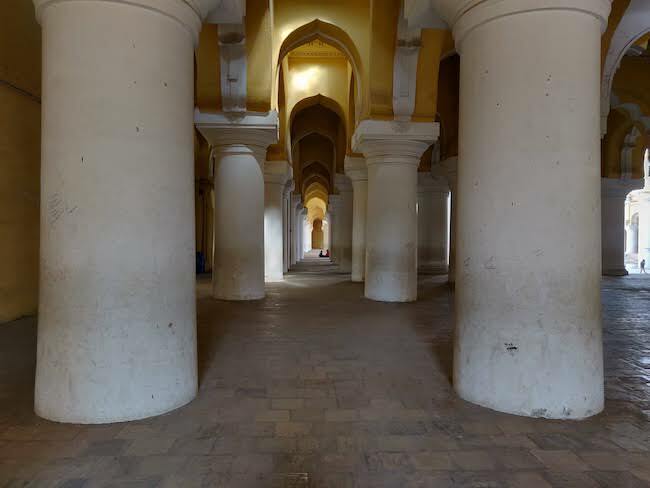 The Thirumalai Nayakkar Mahal housed various public offices. District courts functioned from here up until 1970 and it became a state monument only in 1971. 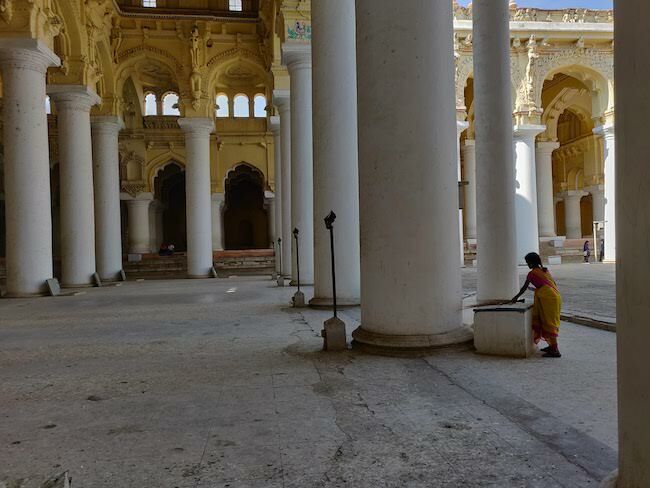 “Anyone who comes to Madurai is keen to write about the Nayakkar Mahal but the truth is there are so many other lesser known beauties. 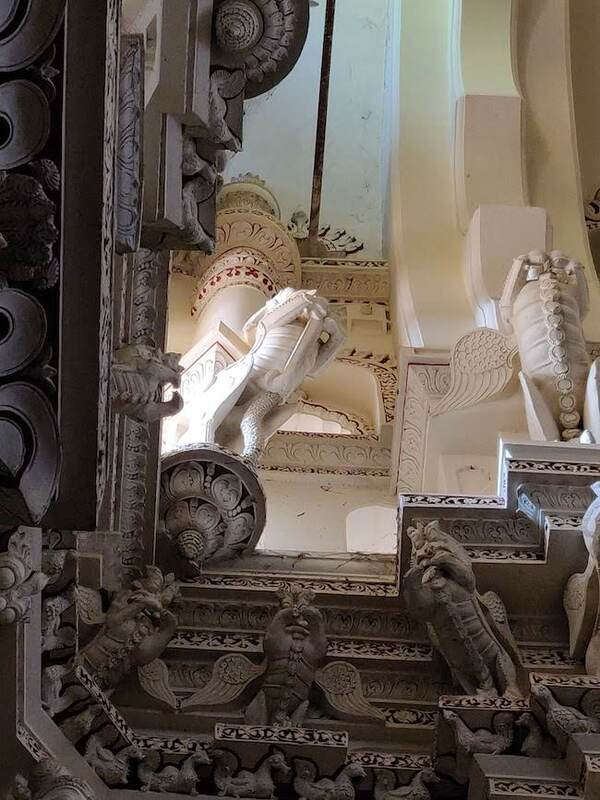 The Ramanathapuram Palace, in fact, is quite under-appreciated,” says Sakthivel. While we make a mental note to visit this palace next, we bring up the unavoidable question. What can be done to maintain the building, a state level monument, better? “We have three important plans coming up. As part of Tamil Nadu Government’s Smart City project, there’s landscaping being done behind the palace. When this is turned into a garden, the Mahal will have a better look. Secondly, we are planning for a general facelift and for this, we are awaiting funds from the Asian Development Bank (ADB). Thirdly, there are CSR funds set aside for sprucing up the general atmosphere of the palace. This will include the library for Ph.D scholars and facelifting the drama theatre and open sculpture garden,” shares Sakthivel. Up until a few years ago, 2011 to be specific, the Mahal was also used by filmmakers. The ‘Kannalane’ song in Mani Ratham’s Bombay, for instance, was shot here. 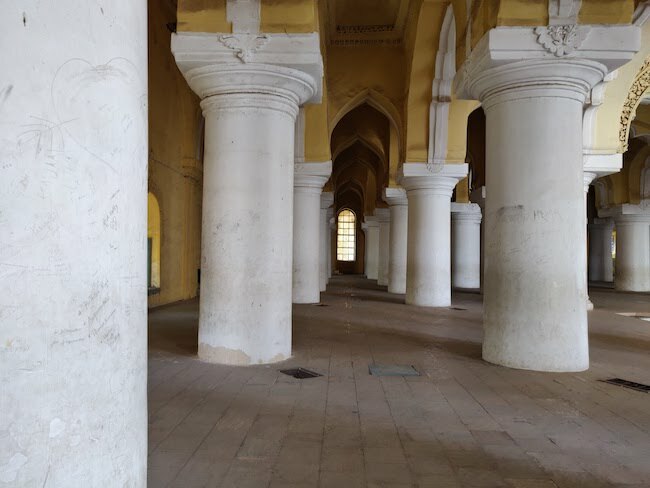 Pointing out that the pillars with millions of graffiti will also be cleaned as part of the facelift, Sakthivel rues the lack of awareness among people to treasure a heritage site such as this. "Madurai has a great wealth of rock-cut caves and monuments of historical value. On my field trips, I regularly find trash and signs of vandalism in these heritage sites. It takes us hours of hard manual labour to clear these damages and sometimes, it is disheartening to see such scribbles crop up again in a matter of days. It is not practically possible to man or guard every inch of these heritage buildings. People will have to be more aware of their responsibilities,” he points out. 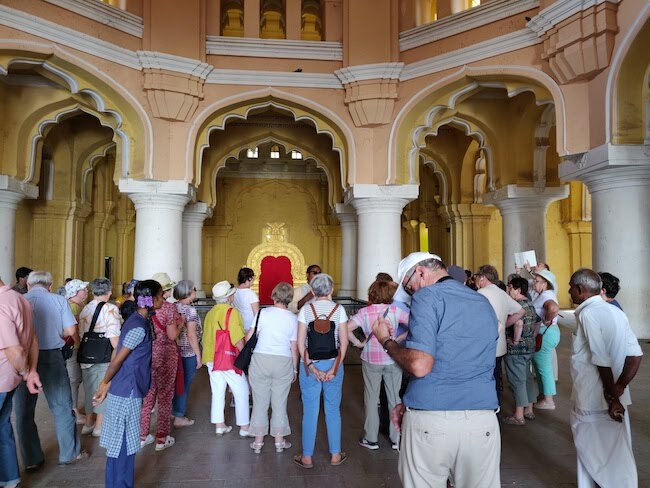 While the Mahal is currently maintained by a crew of 18, half its ideal size, Sakthivel tells us that with more people, things might become more smooth. 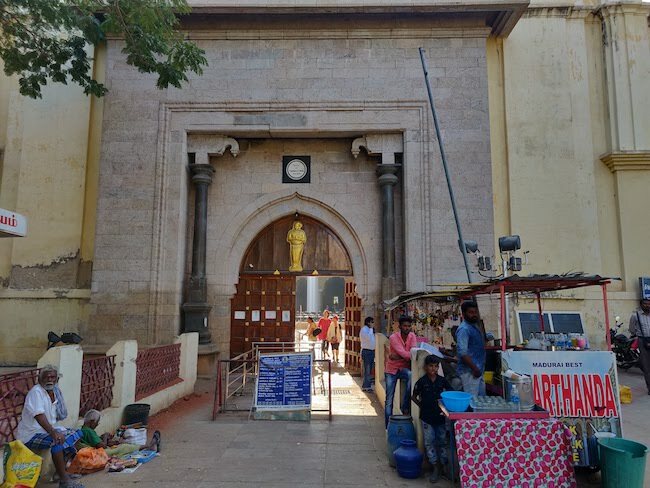 The TN government has also sent out a tender, calling for renovation of a select few heritage monuments and this includes the Thirumalai Nayakkar Palace. The rest of the heritage sites that are being considered for renovation include: Udhayagiri Fort at Puliyurkurichi village in Kalkulam Taluk of Kanyakumari district, Kattabomman Fort at Panchalankurichi village in Ottapidaram Taluk of Tuticorin district, Manora Fort at Sarabendra Raja Pattinam in Pattukottai Taluk of Thanjavur district, Dutch Tomb at Nagapattinam village and district, and Marudhupandiyar Fort at Aranmanai Siruvayal village in Karaikudi Taluk of Sivagangai district. Another challenge that the palace fights today is in the form of a notorious grey-winged avian, the message-carriers of lore - the pigeons. Bring them up and a tired smile spreads across Sakthivel’s face. “Ah well, they are beyond our scope. We’ve tried many ideas, some suggested to us by foreign tourists. None of them work for more than a month. They come back with more vigour. It is impossible to rid the palace of their poop. Things get worse when it rains and when the stench gets very strong. For now, we have no solution for these birds,” he says. Perhaps Thirumalai knew what to do? We wonder.